The first setting to consider is the exposure mode, which you select via the Mode dial. Your choice determines how much control you have over two critical exposure settings — aperture and shutter speed — as well as many other options, including those related to color settings and flash photography. The Mode dial determines how much input you have over exposure, color, and other picture options. Auto and Auto Flash Off: The camera analyzes the scene and selects what it considers the most appropriate settings to capture the image. 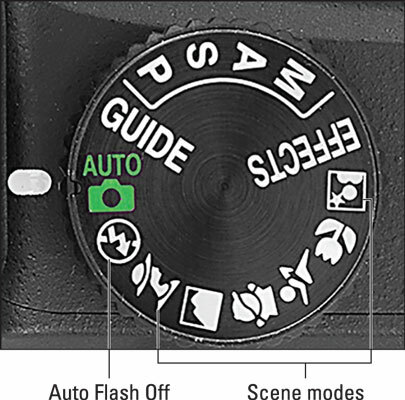 The only difference between the two modes is that Auto Flash Off disables flash; in Auto mode, you can choose from several Flash modes. Scene modes: You also get six automatic modes designed to capture specific subjects in ways deemed best according to photography tradition. For example, in Portrait mode, skin tones are manipulated to appear warmer and softer, and the background appears blurry to bring attention to your subject. In Landscape mode, greens and blues are intensified, and the camera tries to maintain sharpness in both near and distant objects. Flash options vary depending on the Scene mode. Because these modes are designed to make picture-taking simple, they prevent you from accessing many camera features. Options that are off-limits appear dimmed on the menus and the Information and Live View displays. If you press a button that leads to an advanced setting, the monitor displays a message telling you that the option is unavailable. That said, these modes enable you to take great pictures until you’re ready to step up to the advanced modes. P (programmed autoexposure): The camera selects the aperture and shutter speed necessary to ensure a good exposure. But you can rotate the Command dial to choose from different combinations of the two to vary the creative results. For example, shutter speed determines whether moving objects appear blurry or sharp. So you might use a fast shutter speed, which freezes action, or you might go in the other direction, choosing a shutter speed slow enough to blur the moving subject, which can create a heightened sense of motion. S (shutter-priority autoexposure): You rotate the Command dial to select the shutter speed, and the camera selects the aperture setting that properly exposes the image. This mode is ideal for capturing moving subjects because it gives you direct control over the shutter speed. A (aperture-priority autoexposure): In this mode, you rotate the Command dial to choose the aperture, and the camera chooses a shutter speed to properly expose the image. Because aperture affects depth of field (the distance over which objects in a scene remain acceptably sharp), this setting works well for portraits because you can select an aperture that results in a soft, blurry background, putting the emphasis on your subject. For landscape shots, on the other hand, you might choose an aperture that keeps the entire scene sharply focused so that both near and distant objects have equal visual weight. These modes give you access to all camera features. So even if you’re not ready to explore aperture and shutter speed, go ahead and set the Mode dial to P if you need to access a setting that’s off-limits in the fully automated modes. The camera then operates pretty much as it does in Auto mode but doesn’t limit you to the most basic picture-taking settings. To set the shutter speed: Rotate the Command dial. To set the aperture: Press the Exposure Compensation button while rotating the Command dial. Even in this mode, the camera offers an assist by displaying an exposure meter to help you dial in the right settings. You have complete control over all other picture settings, too. One important and often misunderstood aspect of manual exposure mode: Setting the Mode dial to M has no bearing on focusing. You can still choose manual focusing or autofocusing, assuming that your lens offers autofocusing. Remember that with an AF-P lens, you set the focusing method via the Focus Mode option on the Shooting menu. AF-S lenses typically have an exterior switch for setting the focusing method. Effects: As its name implies, this mode provides access to settings that apply special effects to still photos or movies as you record them. For example, the Night Vision effect creates a black-and-white photo or movie that has a grainy appearance, as if you were viewing the subject through night-vision goggles. After you set the Mode dial to Effects, rotate the Command dial to cycle through the various effects. Alternatively, you can apply some special effects to a photo after you shoot it. Guide: Rotate the dial to this setting to access the guided-menu feature, which provides step-by-step instructions for taking pictures, setting up the camera, retouching images, and viewing photos and movies.